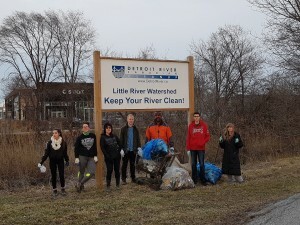 On Tuesday April 2, Essex County Nature was invited by the City of Windsor, the Detroit River Canadian Cleanup and the Essex Region Conservation Authority to participate in a river cleanup in the Little River watershed. Windsor Casino’s Code Green group helped coordinate the event, brought many supplies and sent numerous volunteers to this event. Thankfully, Mother Nature cooperated by being sunny and mild. About 50 volunteers cleaned up the section of Little River between Lauzon Road and Tecumseh Road East, adjacent to the Canadian Tire Store. They worked from 5:00 p.m. to 7:30 p.m. This notorious section of river is infamous for shopping carts. This was the 15th time the community has cleaned up the human debris from this site since autumn1996. Along with the Code Green group, there were volunteers from the City of Windsor, the Detroit River Canadian Cleanup, University of Windsor, Essex County Nature and the Little River Enhancement Group. This hard working group pulled out eight shopping carts (no surprise here), one lawn chair, one bike, one garbage pail, two recycle bins, industrial hoses, two children tents, a large pile of wood, an aquarium, a stove pipe baffle and 55 bags of recyclable content and landfill waste. We are always pleased to see local wildlife surviving in the Little River Watershed. During this cleanup we observed a Belted Kingfisher. There were many people kayaking and canoeing up this section of Little River and they were all thankful for the group to be out there. We appreciated Code Green coordinating this cleanup event and look forward to working with them in the future! We are looking for individuals who are looking to gain some field experience collecting data from a sample of the Earth Day trees planted in spring 2019 with Essex Region Conservation. This event will take place on Saturday June 22 2019 from 10am to 2pm at the green space near Florence Avenue and Wyandotte Street east in Windsor. Parking is available at the Sand Point Beach parking lot off Riverside Drive. Volunteers will walk south down the Ganatchio Trail towards Wyandotte Street. Volunteers should bring their snacks/lunch and re-usable water bottle and wear weather appropriate clothing. Long pants and shirts are recommended with sturdy close-toed footwear. High school students who would like to earn volunteer hours should bring their paperwork along. Spots for this workshop are limited and pre-registration is required. Please register here: https://treesurveycitizenscience2019.eventbrite.ca. For questions about the event, call Gina at 519-776-5209 ext. 245. Spring is right around the corner, and what better way to “dig in” to the warmer weather than with a fun, free, family-friendly tree planting event! 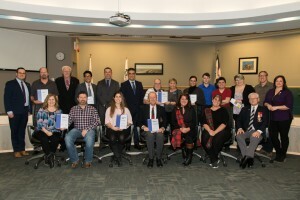 Forests Ontario, The City of Windsor, the Detroit River Canadian Cleanup, Essex Region Conservation and the Little River Enhancement Group are excited to invite you, along with your friends and family, to participate in the 2019 Community Tree Plant event happening in Windsor on May 11 2019 from 10am to 12pm! Check back soon for location and registration details! 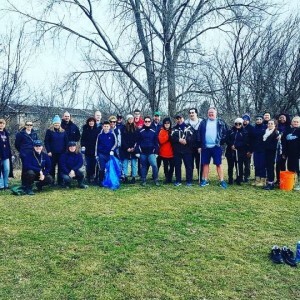 April is Earth Month, and the Essex Region Conservation and the Detroit River Canadian Cleanup are inviting everyone to join us on Sunday, April 28, 2019 from 10am – Noon to help plant more than 2,000 native trees and shrubs in the City of Windsor. While we have shovels to share, you may wish to consider bringing your own to this free event! Event happens at the green space south of Wyandotte between Florence & Martinique in Windsor. Parking is available at the Sand Point Beach parking lot off Riverside Drive. Overflow parking is available at the parking lots off Riverside Drive, adjacent to the Ganatchio Trail, between Bertha and Martinique. Participants can use the Ganatchio Trail to walk to the planting site. Click HERE to register your green team! Individual volunteers are welcome to plant without being part of a Green Team!